Years ago I decided I was going to have the summer of Lisa. I sent my daughter to my mother's house, which was just across the river, but still, I had the house to myself. I looked forward to all of the fun and adventure I was going to have in those three months. The first week of summer I went to Crown Royal night at the Black Rep, a local theater company. Good liquor and a good story are two of my favorite things, so this was the perfect night. My favorite DJ was hosting the event, free Crown Royal was flowing and the play, which I can't even remember at this point, was probably outstanding. Fast forward a few hours and I stumble into the house in my cute shoes and one of the many dresses I'd bought for my summer of Lisa. I didn't bother to turn the lights on because like most people, I have the layout of my house memorized. Lo and behold, I tripped over a pair of Birkenstocks in the middle of the hall, broke my big toe and spent the rest of the summer wearing those same Birkenstocks and walking with a cane while my really cute dresses hung in the closet. 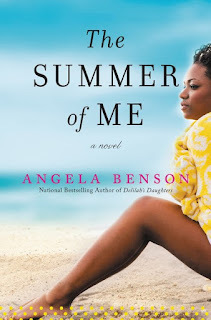 When I read the synopsis for Angela Benson's The Summer of Me, I was sure I would relate to Destiny Madison. Though her exact age is never given, I would guess that she's 25 or 26, based on the age of her kids and the year she left college to have the twins. The twins have the opportunity to spend the summer in California with their father and stepmother and while it scares Destiny to let them do so, she knows that time alone will give her a chance to work an extra job and save money. It's important that she find a house near the twin's father before the school year starts so that the kids can attend a better school and be close to both of their parents, not just their father. Even as Destiny's need for money leads to her involvement in a slightly illegal scheme, she also finds herself designing a new program for church that has her working closely with Daniel, a handsome pastor and former investigator. Is the book predictable? Sometimes. Is that OK? Sure. Would I read another book from the author? I couldn't say for sure and here's why. I'm a stickler for time lines and characters that make sense. At one point, the wife of Destiny's ex talks about him finding a 12-step meeting he was comfortable with. Well that's good, but what was he addicted to? Did that ever play a part in his relationship with Destiny? Does it affect his relationship with his current wife? I have no idea because it's never addressed again. It seems to be irrelevant, so why even mention it? Also, the twins are supposed to be six. They both have cellphones, talk on Facebook, Skype with their friends and make videos. I know kids today are much more technologically advanced than when I was a kid, but I don't know six year olds with Facebook accounts because Facebook doesn't allow it. Who are these other children the twins are Skyping with? Who gives a six year old a video camera? The story line could have made just a little more sense if Destiny was aged by 10 years. Sixteen year old twins doing those things make much more sense than six year old twins doing them. Like I said, I'm not sure that I would pick up another book from the author, but it's an overall easy read. If you have a few hours on a lazy afternoon, you'll breeze through it quickly.